Hey guys, been a while since I've been here. Hopefully someone can help me understand this. I recently was given the tip that while you're mixing for STEREO always check and make adjustments in MONO as you go and it will help guarantee your mix sounds good across systems. I thought, great I'll just toggle the MONO button on my output channel strip and baddabing! Yea, not so bing… When I click the output channel strip to MONO via the button at the bottom of the fader level light on the output channel strip, going from OO to O. It becomes a mono mix in one ear and another mix separate from the fader control in the other… I'm super frustrated that it just doesn't make the output switch from stereo to mono… and I'm failing to understand what's happening and why… Why when you make this switch do the output channel plugins disappear? Why are there channels that are audible in the background and independent of the fader? More importantly how can I set up to easily toggle between a stereo and mono mix for reference? Keep your output channel clean. Always have a "Master Bus", which is an Aux, as the last instance and which should represent the end of your mixing chain. From there you can route as you like, with sends and everything, change the final output or whatever. For example: I strictly route to my masterbus which I called "SUM" and afterwards I have only two plugins in the output channelstrip, an "Ice9" for protection and a "TB_Isone" for headphones. Never anything else. I've just updated to the newest Logic. Where is the mono button? I am pretty sure that there was one, because it did not work properly. If I want a mono switch in the output, I take the Logic gain plugin. But there is/was something strange. This plugin always sounded "less mono" than the mono button on an interface or a monitor controller. Is this possible or am I crazy? Strange. Btw, I love the old Digi002 Rack interface. It features a separate monitor output for the speakers with a knob and – Voila! – a mono switch. Of course, if your music needs to be mono compatible, you have to check this. And some things are better heard in mono. But making a rule out of it by saying, "always adjust in mono" goes too far. And there is another issue: If you output in mono and listen on both your speakers, you still hear partly stereo because of acoustic irregularities. It's called "big mono". If you really want to get most out of mono mixing, switch to a single speaker in front of you. I love that and use it quite often. 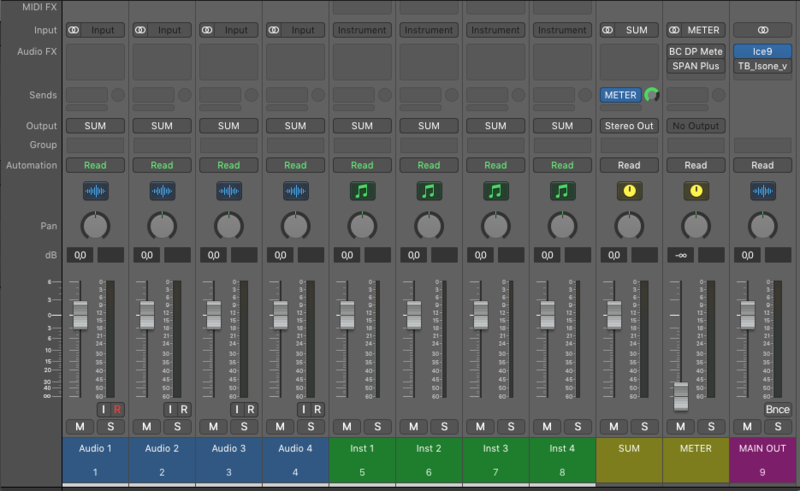 Would you mind grabbing a screen shot of the "End of your mixing chain?" Peter, I also wanna say thanks! You've been here a long time and helped me a bunch along the way. This has been an incredible resource. It's quite easy. Forget about the output channelstrip, this ist just one point where audio can leave Logic and this point is variable. Always establish an Aux channel as your one-and-only mixing target. Mine is called SUM. Technically you can go to everywhere from this "end of your mixing chain". Such a template works for everyone as long as we talk about stereo. For surround and multichannel it would look different. The screenshot above is from Logic X, but my small templates remain unchanged since many years. I just recreate them with each big update to stay compatible.